This is the full text of the speech of Nikos Theodosiou,artistic director of Camera Zizanio, at the roundtable discussion on the topic “Kids, youth and Media Literacy” held in Valencia on January 19, 2013 in the context of the first “Mostra International de Cinema Educatiu” . The others participants of the roundtable were people with extensive experience in the cinema for children and young people: Gunther Kinstler (Rainbow Project) Germany, Paolo Beneventi, (Director of Bambini Oggi Brescia) Italy, Birgitta Olsson (Film consultant, Film i Halland) Sweden, Paula Jardon (dean of the University of Valencia) Spain, Nuria Cidoncha, (Director of the Institute of Cinematography and Audiovisual Valencia) Spain. Every day, on my way to the office, I’m crossing from the same square. At this square prevailed one of the most beautiful cinema theater of Athens. A few years ago I watched a rather unusual activity. For many months I was shooting with my camera the slow demolition of the cinema theater. Until it turned into a pile of ruins. The end of the cinema meant the end of an era. Cinema has disappeared from the squares. Has disappeared from the public place. Television invaded our homes. In a different form. With another aesthetic. Here we have the great contradiction: cinema, from a social relation turned to an individual matter. That had as result the reducing of public places. Through this, the need to regain the lost ground was created. “School in Cinema” program was developed for the promotion of quality cinema, film analysis programs. I am referring specifically to France that is pioneer in this field. With the development of the digital technology, the contradiction has intensified. Moving picture permeates in all aspects of personal life. A laptop or even a mobile phone replaces the TV screen. Following the contradiction: each one began developing the capability to produce their own audiovisual works and distribute the information via the Internet. We can say that we have a democratization of media but have we actually won democracy? Those who have great funds can bombard us with their own programs that are spectacular and attractive but fraught with many risks. The big economic interests do not coincide with peoples’ interests. From this, the need for a different attitude of the audiovisual education was born: Cinema in school. The education in order to produce their own films. The spectators to become the creators. What’s from the other side should become ours. By starting this procedure from the early ages. This necessary direction in education is now recognized by all, and there’s no need to argue about this. It’s recognized by the leadership of the European Union. Of course the question is what has happened so far. Only a few and individual programs. In every international meeting that I’ve taken part, what you realized is that there’s not a general plan. There’s not even coordination in a European level. If fact, there’s a denial from the educational system of the state to integrate audiovisual education. We are not surprised. Artistic creation requires freedom in thought and in action. Nowadays, that’s not something they like. Especially now, that everyone should obey the orders of the IMF. We feel as they have declared the war against us. What is the current social reality in which we try to promote audiovisual education among young people? Children in schools faint from hunger. In 2011 in Greece, 3.5 million people were in poverty. In a total population of 11 million. People reach the extreme limit of despair. We record suicides. More than 1 person per day puts an end to his life. The humanitarian crisis is in front of our eyes. The International Committee of the Red Cross admits that is facing “unprecedented challenges” as the phenomenon of poverty in Europe’s austerity takes dimensions of a humanitarian disaster. And declare that the two following years will be very difficult for Europe. According to official estimates in the second half of 2013 the number of unemployed in Europe will exceed the 20 million. Greece is expected to reach 28%. In Spain 27%. This means that we are facing a social disintegration. Cuts in the cultural arts and education have shattered us. They believe that the funding of cultural activities is useless as they don’t make any profit out of it. How is it possible, they say, to ask money for cultural activities when we currently have cuts in wages, pensions and poverty spreads. And here exactly we can see the real extent dimension of this problem. I come from a country where, as it is known, democracy was born. That was not accidental. The idea for a different political system was based on the great development of culture and art. Not any art. No painting or sculpture but the dramatic art. Poetry that is combined with the mass spectacle. Art that belonged to everyone. All citizens of the city – state of Athens had to attend the drama events. For those who were poor, the state had adopted the Theorica (Theoric Fund). The state paid for those tickets. Culture and art are synonymous of Democracy. Culture and art is a matter of society and not some individuals. Any retreat on this issue means that we open roads to any anti-democratic regimes, fascism. According to all these, we’re dealing with our own Festival and all its educational action. Delegations of youngsters sent abroad for participation to festivals and film workshops. This year we faced the biggest challenge. Until the last moment we had not received any funding. But we fought it and achieved a first victory. We organized an extremely successful festival. If we could make a schematic representation of the Festival we would use a pyramid. Many festivals start with the basic funding (public or private) and extend with the activities that reach the base. As long as they have funding. If there’s no funding then they collapse and stop their activities. We start building our pyramid from the base. At the base, we have the direct recipients, who are the children and the youngsters. The pyramid erects to the top at those who have the power by claiming the funding. The Festival of 2012 in few numbers. 7.067 spectators at the screenings of 51 films at the Competition Program of the 15th Olympia Film Festival. 1.200 spectators at the screenings of 351 films (180 from Greece) of 12th Camera Zizanio. 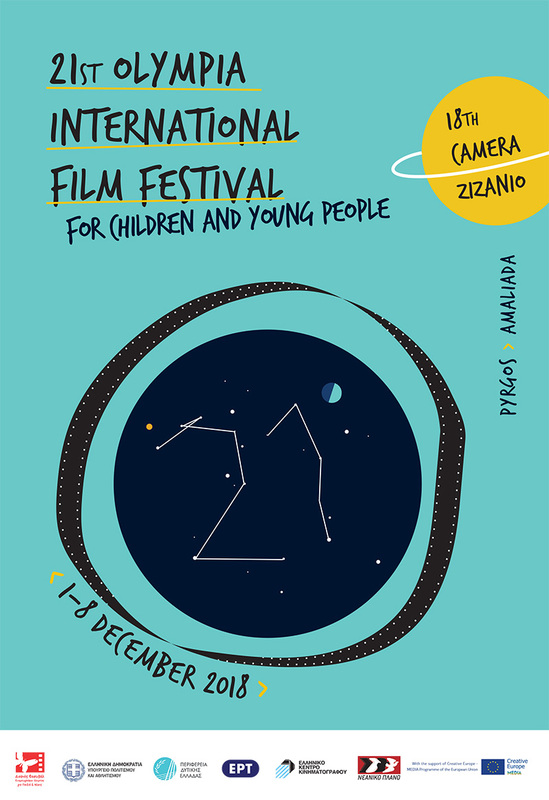 9.317 spectators at the 11 cinemas of the Parallel program “Zoom in European Children’s Films”. 3.872 attended the parallel events or participated in various activities. 2.698 participants at the Side events (Theatrical performance, Photography Exhibitions, authors at Schools etc. I’m not mentioning all this to show how capable we are to organize a successful Festival with less money. Our budget was one third of the budget we had in 2010. The reason for our success was due to the passion, the voluntary contribution and mass participation of the children. Because we have a stable and permanent contact with young people. For those children, the festival isn’t only a great event but a way of life. Children who grew up but still return every December to Pyrgos. We know that such an action is a social necessity which must continue. Together we can stand up for it. The power comes from inside of us. What is needed is to organize a joint action.